I promised you guys a small post about my brew CandleFactory so here it is. I’ll go through the idea I had, my testing and what I found works and not. 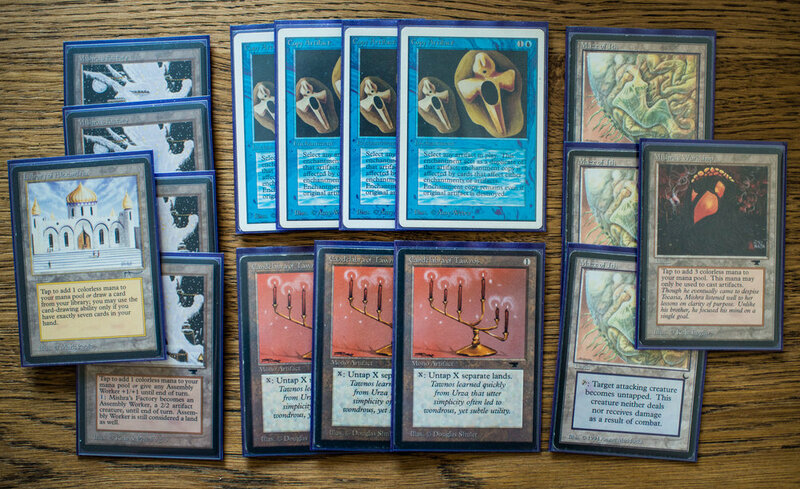 So, the idea for the deck is quite simple and it started with me liking Candelabra of Tawnos and buying a second one. The plan was to build something with Mana Flare but I began having fun with a stupid Lands deck instead. That didn’t work out and I put aside the Candelabras and instead focused on re-brewing my Field of Dreams deck (Kevin Costner.dec) and while brewing on that one I dug up my seldom used Copy Artifacts. That’s when it hit me, one of my favorite things to do with Copy Artifact is to copy an activated Mishra’s Factory (you then end up with an UN-activated Mishra’s Factory that is an Land Enchantment) and as Factory is good with Candle that might be something worth playing. The idea struck me about an hour before my friend Johan Råberg was going to come over for a couple of games so I just put together something rough to test against him in that hour. As Factories, Copy Artifacts and Candelabras is far from a complete deck I quickly decided to also put in my absolut favorite combo in the format Guardian Beast + Chaos Orb. And if you want that combo you should probably have some Transmute Artifact to be able to find the restricted Orb. And if you have Transmute and Guardian Beast you should also play some fun artifacts to get and protect so I added Icy Manipulator, Jayemdae Tome, Su-Chi, Triskelion and some junk I don’t remember. Of course I also added a couple of Maze of Ith as they are amazing with Candelabra. Add a bunch of mana and restricted cards and you have my first version. After some goldfishing though I felt it was a little boring to use the Candelabra for only Factory and Library of Alexandria (now, that’s a thing of beauty!) so I actually added 2 Fireball and 1 Mana Flare just for the sake of it. After Johan came and we played some magic the deck actually worked better than expected and I got to win against Johan both with Mana Flare, Candle+Factory, copying Su-Chi/Triskelions and Beast combo. The problem was however that it was super vulnerable to Armageddon so I wanted counterspells. That’s how the red package went out. It was mostly just cute anyway. 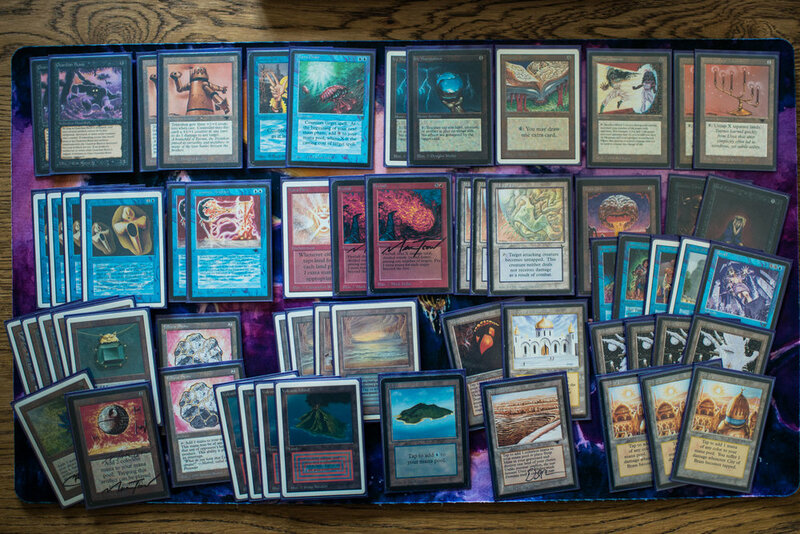 I didn’t think much about the deck after that until Johan once again came over for some games the day before the tournament Alphaspelen 3. Then I actually tried some new builds and decided to play it at the tournament. The reason however, was mostly because when he went home I went to sleep so I didn’t have the time to build a new deck. I actually didn’t even build a sideboard and just took 15 good cards right before leaving for the tournament. But let’s rewind to the day before the tournament. As said before I had removed the red Mana Flare package for Couterspells and that was what I tried this evening to much success. The last thing I changed was to remove red completely and instead put in white. 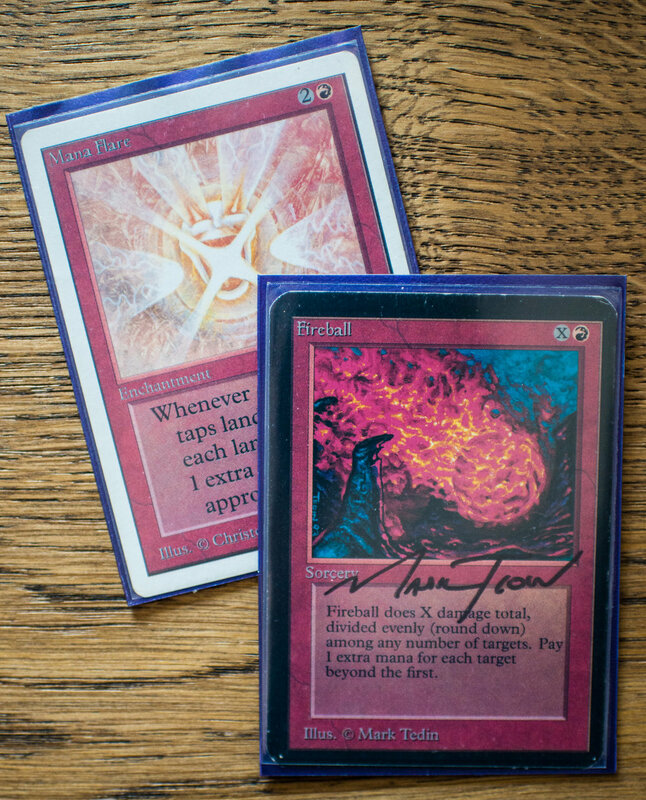 The reason I still had red was to have Red Elemental Blast against Energy Flux. But I decided white was better because of being able to also Disenchant Underworld Dreams, this is a slow deck after all. As I’ve already done a tournament report that is not what I’m going to do here. Instead I’m going to write about a couple of findings from playing the deck. Copying one of my three threats was something I did more than I expected and it was great having that choice to be able to win quickly when needed. This also protected the Guardian Beasts for a late game combo, as the opponent used removal on my other threats. Don’t know what the right number of threats are though. The Reconstruction is nice but sometimes it just get stuck in your hand. Don’t know if I should cut it or not (I probably should, but I love it!). Having more than one Candle in play can be amazing but the deck becomes real mana hungry when you want to activate a couple of Factories and also untap them a couple of times. 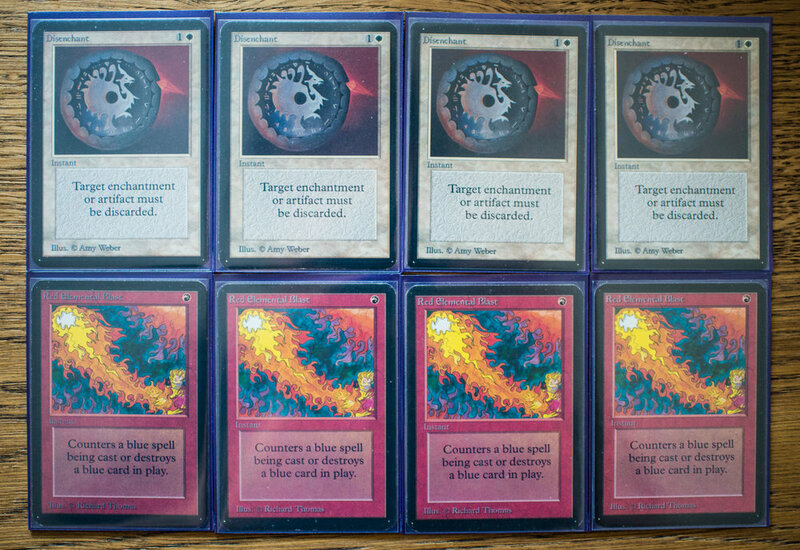 I now own a third one but I think two is the right number with Transmute and Copy Artifact. Copying Icy Manipulator was fun and I quite often did it and won by using Icy as mana denial. I would love to play more Icy Manipulators to actually have this is one of the main plans. Two Guardian Beast seemed like the right number, sometimes they block small critters, sometimes they allow you to combo and sometimes they just protect stuff as they were designed to do. It’s always nice with a counterspell in hand to protect the combo or against Armageddon but as the deck mostly plays out like a tap out control deck I think three is enough. The split between Mana Vault and Fellwar Stone is something I’m not sure about. Mana Vault is amazing as we play a lot of 4-drops and with Transmute you can get rid of it as well. Therefore, I would like more. But as Factory and Candle is so mana intensive we also need a steady source of mana, like Fellwar. I’ll probably continue to play a split. I liked being able to board in more Beasts, maybe I even would want one more. Mostly against creature decks with Swords to Plowshares. Against those decks my creature plan is so much worse than theirs so it’s really good to be able to combo in the late game. It also gives us two more good blockers. The Disrupting Scepter was just there because I had no idea what to put in the sideboard. The Ivory Towers should probably be cut as we are a tap out control deck and want to play our cards instead of keeping them i our hand as you can do with Swords and Counterspell. A COP: Red should be a good inclusion because sometimes you can get in control but still have a long way to go before you can kill the opponent. If he or she plays burn that is a big problem with only three counterspells. Against control decks, and maybe also combo decks, one more counterspell would be nice to have access to in the sideboard. Sure, we play Guardian Beast but one City in a Bottle could be nice as a Transmute target against Arabian aggro and more. Actually I haven’t played much more with the deck so I don’t have many more findings to write about. I have however brewed and thought about it a bit to see what different directions you could go with the deck. I’ve narrowed my ideas down to four main builds but keep in mind these are all just rough sketches. This is the version I played at the tournament. Skipping the red, skipping going aggro, and playing the Guardian Beast combo. There is however a couple of ways to build this as well. I’ve looked into playing the beast in the sideboard and The Abyss main, or the other way around. Mostly to have different game plans depending on the matchup. But I haven’t gotten this to work yet. But sure, with The Abyss main you become really good against creature decks and against control I think the combo is the best. This build skips the beats and instead plays The Abyss, as it is amazing with Maze of Ith. It also adds a couple of more artifact creatures to go with the Abyss and it’s probably the best version. It is however also the most boring build as you more often than not loose track of the main idea, copying factories and using Candelabra. And you also loose the beast combo. In this build I've also decided to cut Counterspell and Transmute Artifact as there is no combo to tutor for or protect. Lastly I also switched to playing 4 Mana Vault instead of a split between Fellwars and Vaults as this deck wants to ramp out a creature quick and copy it. You can do the same as in the above build but instead of more creatures add more Icy Manipulator to become more of a tap out control. In this build the copy factory plan is still valid and good. I like this quite a bit as it does everything I want, except comboing with Guardian Beast. I also added more books and cut a Transmute Artifact as I don’t need to find the combo. This is the first version I tried, the one that splashes red for Mana Flare and a couple of Fireballs. I don’t think this will be even close to as good as the other builds but it’s absolutely the version that will give you the most varied game play, as you have so many different game plans in the same deck. It makes the Candles even better but without a Fireball in hand you don’t want to play Mana Flare so it’s a bit clunky. That’s why I only play one. The cards to cut is harder though. You want Counterspell to protect one of your two combos but there isn’t much else to cut. Maybe the artifact creatures, but then you really need to draw a factory for your Copy Artifacts to do anything. That’s all my thoughts for now. I will continue to brew on this for a while and test different things, but I wanted to share my initial thoughts about the deck. I lean towards playing either the Icy control with The Abyss or a more opted version of what I played last time. The Abyss version is probably the one which is most true to my initial idea of copying Factory and hitting hard with Candelabra of Tawnos. But then again, the beast combo is just so fun. How about an Elder Dragon in your face? Last Sunday we had a small tournament here in Stockholm with 12 participants and I decided to write a small tournament report about it. Mostly because of the deck I chose to play, a new brew I call CandleFactory. 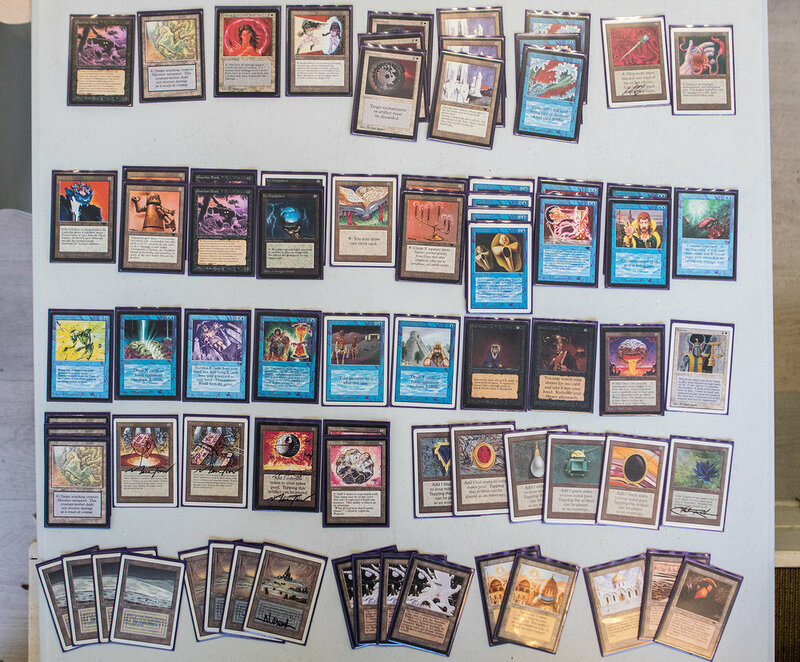 I got the idea for the deck just a week before the tournament just before my friend Johan Råberg was about to come over for some play testing. The plan was to play test a new build of my Field of Dreams deck to have it ready for the next big tournament I’m going to go to but I just needed to try out this idea first so we played a couple of games with me on this deck first. The day before the tournament we played again and I decided to give it a shot as I didn’t have the energy to build my Field of Dreams deck. I actually didn’t even build a sideboard for Candle Factory as it was only an idea and not meant to be played yet. The morning after I took 15 cards in 15 min to make a sideboard so please don’t judge me for the stupid choices there. I was just too tired to do anything else. I’ll write a couple of words about the deck now but I will post a “deck tech” or more of a brewing post later on describing my thought process, card choices and also publish 2 - 3 more iterations of the deck. And all except one of them are probably a lot better. The main plan of the deck is to use the interaction between Candelabra of Tawnos and Mishra’s Factory to make your Mishra’s BIG. It is not uncommon to be able to have a 6/6 Factory. 4 Copy Artifact is mandatory because they essentially let you play with 8 factories or get another Candelabra if needed. That was the foundation that got me brewing and this time it ended up with also playing Maze of Ith (super with Candelabra), Guardian Beast combo with two Transmute Artifacts and also a couple of artifact threats that are good to copy with Copy Artifact. But I’ll leave it at that for now and get back to you with a more in depth post about a couple of ideas and how it actually works but I’ll give you a short tournament report so you can read a little bit about how it worked this time at least. It will actually be my first “real” tournament report as I seldom have time after a tournament to get my thoughts down or I was to drunk to really remember anything. But this time no alcohol was allowed and I’m home sick because of my chronic tiredness (yes, it’s actually a thing but a little more complicated than that) so here goes. Decklists for all of my opponents and the other players at the tournament can be found here. My first round was against the newbie Böte who had put together a Trick Deck. The first game he lands two Howling Mines quite quickly but he can’t find a Underworld Dreams after I Mind Twist one out of his hand. After that I’m well ahead of cards and have a better board so I drop a Icy, copy it and start to tap his Howling Mines so we just draw one card each. My Factories then finishes the job with the help of a Candelabra to make the two of them hit for 6. In one of the matches I also get to use Candle on my Library of Alexandria before he Sinkholes it. That was fun and exactly what the deck wants to do. Sorry to say that this became a feature match as Magnus doesn’t do much for both of our games. The first game I play an early Su-Chi and he got stuck on mana. Later I end the game by playing a Triskelion and copying it.The second game he plays a couple of small creatures but I have a couple of Maze of Ith and Candelabras so I’m not that afraid. I play three(!) Copy Artifacts on my single Factory to make it a playset instead and with the help of Icy Manipulator and a copy of that I get past his Argothian Pixies to get the kill. One time he triple block my Factory but got the math wrong as I could pump it to a 6/6 and kill all three creatures. This is where I started to become too tired to play as I hadn’t slept well for a weeks or so because of reasons. But I don’t think my misplays actually mattered and the match would have ended in the same way anyway, at least that’s something. The first game I keep a hand with almost all mana and hope to draw good things. I also draw quite good but he has all the answers he needs and Crumbles my Icy and everything else I try to muster. I stabilize but it’s too late and he just need to wait for a burn spell. Game two I get stuck on four mana after being one turn late with my Guardian Beast and he gets a Fellwar and Mox with a Shatterstorm. I never draw more mana and died with cards in hand without ever drawing a Maze of Ith. Don’t remember much of this as I mostly wanted to go home. Game one I know he rides a turn one Serra to victory after also hitting his Chaos Orb so he can destroy my Maze. Game two I get to copy my Triskelion two times but they don’t do much against his Personal Incarnation. I trade a little, get in some damage and it looks good but I need something more for the last push. I draw my Reconstruction, pick up an Icy and it’s over. Game three is the game where I really doze off and don’t remember. I think he just had all the answers to what I did and my Mazes kept on hiding in the library. That concluded the swiss portion of the tournament and as I was 2-2 I was expecting to be able to at least take it a little easy, even though I needed to stay because I ran the stream. But, it happened to be so that I had the best tie breakers and made it to top 4 anyway. Always fun to top a tournament but this time I would have rather been able to stop playing for the day. I may seem a bit negative here but I was not feeling to well this day. In the top 4 I got to play against my two losses from the swiss once again. So, let’s see if I can draw a little bit better this time as I think a creature deck like his is a good matchup for me. This match was on stream so I can tell you what happened as I watched it afterwards. First game I mulligan to 5 and want to give up, I don’t have the energy for that. He starts by Strip Mining my land and Crumble my Mox and Fellwar. Fun times after a mull to five. I’m still able to put up a fight by starting to copy his Su-Chi with my only two lands. It trades for his Factory+Bolt and I get to play a Triskelion the turn after thanks to a Mana Vault. It trades for his Su-Chi and then he’s down to just a Factory. After some back and forth he deploys a bunch of threats which I'm able to fend of with my Candlestick and two Maze of Ith. Then I topdeck a Demonic to get Balance and kill all of his creatures. Maybe I can get this to work anyway? Sadly no, he topdecks Wheel the turn after and gets three rituals and a Fireball to close the game. After that I take down the next two games by assembling the Guardian Beast and Chaos Orb combo quickly. It all went fairly quickly and I was so happy for that but I still got one more match. I should also add that I board in the third beast and board out a couple of expensive artifacts as his answers are so cheap for the artifacts but he has problems removing the beast. So this was the plan. Before the game starts everybody except us leaves which makes it a little boring and as I mostly want to sleep I’m about to scoop. I ask Andreas if we can play the match at another time as no one is left but we decided to play anyway. Something I regret hehe. But that’s part of playing a tournament, you need to be able to focus all the way through. In the first game here I get a Mana Vault and Mind Twist away his hand turn two, such a fun card, not. He still is able to almost win with a Factory as I draw nothing. But I stabilize with a Book and a Guardian Beast to block with.Then I end the game with a Triskelion and Copy Artifact. Oh, how I love that card! Game two he get’s a crazy start with Time Walk and Timetwister and I draw no fast mana at all. I still am able to catch up and later assemble the combo for the win. But I need to hit one important flip to do it. I miss because of my sleep deprivation and he takes the game. In this game I also decide to board in the 3rd Beast tro try to win that way. I do however keep my other creatures in hope of overloading his plows. Game three he draws perfectly by playing two Lions and then an Armageddon against my land centric deck. I still have a chance as I’m on 5 mana with a Mox and two Sol Ring (thanks to Copy Artifact) and have a Triskelion in hand. One land and his Lions will die and it will look good again. He follows it up with a Dust to Dust and I pack it up because I just want to go home. So that’s how the deck plays. It’s a pretty bad deck but it was tons of fun as it plays out so differently all the time. A big part of this is the Transmute Artifacts and Copy Artifacts which can be uses as many different things depending on how the board state. Either you make a bunch of Factories and Candles and win that way, or you copy Icy to control the game hard, or you go aggro by copying Su-Chi and Triskelion or you just assemble the Beast combo for the win.